One of my regular customers, Ade contacted me as he fancied some decent roach action. After a fantastic session with another customer I was hoping to return to the river Blackwater yet a couple of days of heavy rain had put the river in my back garden over its banks so I knew that further downstream it would be almost impossible to fish. A last minute change of plans saw us heading to a local lake, one that has a track record of producing, if not the biggest roach, a good stamp of fish and straight away he was into his first roach, one around 10oz. This action continued for the next three hours as roach after roach came to the net, the best probably around 1lb 4oz. Come midday and with the sun breaking through the clouds the action slowed and as Ade only fishes short sessions he was well happy having found a new roach goldmine close to his home. t forget you can always get the other half to buy 'A day with Duncan' voucher for Christmas! You never know what you are going to hook next? big grayling. The day was challenging as the fish weren’t really up for it so I had to keep moving around to find a few fish as well as trying to keep my presentation good in a strong south west wind. I also wanted to keep away from known swims and find some new areas to give future customers plenty of scope and diversity. Two hours into the session all I had to show for my efforts were half a dozen modest fish but then the float sailed away in a new swim and a fifteen minute battle commenced. with 5lb main and a 3lb 6oz bottom to a size 14 hook baited with two red maggots the culprit kept me guessing to what it was. At first I thought it was a massive grayling but it just got bigger and bigger. Was it a pike that had taken a small grayling or could it possibly be a stray carp as this fish stayed deep and at one stage headed upstream but slowly it tied and then the tail gave it away, well almost as it was definitely either a salmon or a big trout. Finally she went into the net first time thanks to the expert landing duties of my mate Chris and we both thought salmon but I have been informed that it is in fact a bi brown trout and weighing 8lb 2oz is my first personal best of the year. After this fish and suffering from what I think is Tennis Elbow I wasn’t that concerned if anymore fish followed but right at the end of the day and once again in a new swim the float buried and a 2lb 3oz grayling graced my net. Non-stop action on the river. bumping into one is good. Arriving at first light we had the stretch to ourselves and initially headed to a swim that is what I call ‘fish soup’ as although it doesn’t produce big fish it does allow an angler to hone in the skill of trotting and soon Ross was catching a variety of species on maggot which included grayling, brown trout, sea trout, salmon par and dace. Ross had never caught a sea trout so recorded not just one personal best but two as one of the dace was his biggest ever. be a two? Indeed it was and at 2lb 5oz our goal was achieved and with the rest of the day ahead of us we could relax and enjoy the fantastic fishing that was too follow. Roving around Ross just couldn’t stop catching and come the end of the day three more tow-pound plus grayling had graced his net, the best going 2lb 6oz in a catch that saw more than fifty fish taken! In session for a 2lb roach. A two-pound roach to many is classified as a fish of a lifetime, however choose the right venue, get your tactics right and put in some extra effort into each session and such a fish could just grace your landing net sooner than you think. Anglers Mail blogger, Nash Ambassador and Angling Guide Duncan Charman recently put all his knowledge to good use in what was supposed to be a campaign that might continue right through the winter, however his search for the two-pounder has now become a search for that exclusive three, read on. Image 1 – In most cases a two-pound roach comes after careful planning and plenty of hours on the bank, but not on this occasion. Before explaining the events of my first session in search of such a fish, let’s look at my thoughts leading up to the eventful night. The venue, one that I’m extremely familiar with, isn’t one that gets roach fished that much, however every now and again a big roach accidentally gets caught, usually on a boilie intended for carp. These captures are rare, yet every time it does happen the reports are that the fish was big, but unfortunately as it’s not the species intended, goes un-weighed. Making a mental note of such captures isn’t enough for me, as I will forget them, so I always write these down under species name and then when I feel ready to target a certain species simply refer to these. Now I’ve been fortunate to land roach almost twice the size of my latest challenge and have fished venues such as willow Lake on the Lynch Hill complex when it was in its prime, yet a two pound roach nowadays isn’t an easy target and in most cases needs to be planned with some serious thought. Knowing that one of my local venues had thrown up a few big roach in the past started to ignite my imagination, the time seemed perfect and even though I knew my target existed, just how big did they grow? It was time to make a start and find out. Now some may think it’s strange that if I’ve extensively fished this lake, for more than a decade, then why haven’t I caught roach by accident whilst targeting other species, namely tench? The answer is simple; tench are predominately daytime feeders, as opposed to roach that are very nocturnal. Roach tend to start showing later in the year when the water temperature drops, a period that sees my previous chosen species slowing down and a time when usually I’m not there. Roach are also very fussy on what they eat and where plastic baits have almost taken over as my hookbait when targeting tench, roach tend to like the real deal, live maggots. Put all these factors together and its seems perfectly understandable why a few roach haven’t come my way! Image 2 – Plastic maggots/casters do work but you need to put lots of loose feed maggots around and get some competition going between the fish. They also work when small nuisance fish are around but when feeding sparingly there is nothing better than the real thing. The session, changes made during and reasons why. A new campaign for me means catching my target species if possible during my first session irrespective of size. Even if it’s just a few ounces then this would be classified as a result that can be built on over the next few sessions and having caught so few in the past, any would mean enjoying a glass of red whilst tweaking plans for future visits. One thing I think is worth pointing out is contrary to what other anglers say, when maggots crawl out of a feeder they don’t bury themselves out of reach of fish, they simply move around six inches either side of the feeder before moving no more. Yes, they may crawl under the odd decaying leaf or dead weed yet just like a Robin will locate a maggot under a leaf in your swim, a fish will do the same. If you want to see this simply fill a spare feeder, drop it in the margins of a clear lake and watch. It will let you know what’s happening around your feeder after casting out. Image 3 – If you want to know what’s exactly happening around your feeder after you have cast out then try dropping one in the margins and watching. The autumnal fall was well and truly underway as I arrived at the lake with just an hour to spare till darkness descended. Spending time choosing a swim wasn’t an option; however this is where knowledge of the venue and watercraft plays a massive part in success and failure. The wind was from an undesirable east, yet it was on the change and in less than twenty-four hours would be blowing in warm from the south west. If I had arrived a day earlier then I would have positioned myself towards the south-west corner, yet this area gets rarely fished so knowing this did play a massive part in why I choose to ignore it. Instead I went against all my watercraft and decided to fish with the easterly off my back, why, let me explain? Firstly if I’m warm then the water in front of me will be slightly warmer than the rest of the lake. These swims also see lots of other anglers frequenting them during daylight hours and this means that they have a constant introduction of food and as it still wasn’t really cold my thoughts were that this food may have kept a number of fish in front of them. I also thought that as the wind had been from the east for over a week these fish may well have not fed heavily for a while and maybe, just maybe were ready to take advantage of the changing conditions and go on the feed. My only negative thought was that I was that the area chosen was in the shallowest area of the lake and already having had a few frosts may well have seen the fish move into deeper water? It was a risk, but a risk worth taking, as if come the morning my efforts had gone unrewarded then I could almost tick this area of my list come future visits. The one thing that I was however going to do was to fish much further out than what I would normally do, the reason behind this was that if the fish were still here then the easterly wind that had been with us for a week or more may well have pushed the fish further from the bank and off the back of the wind. Image 4 – Looking across the lake at dusk often determines how much food I will introduce. Lots of fish moving means lots of food, little movement means edge on the side of caution. The amount of feed introduced at the start of each session is one that should be thought long and hard about, well in advance in fact, along with just before casting out. Time of year, amount of fish the water contains, weather conditions all pay a part in deciding how much feed to introduce, however all these premade plans could be thrown out of the window simply by taking time to look across the lake and watching for fish movement on arrival, something that so many anglers fail to do. If I had arrived and saw fish moving all over the place then I would have no problem getting the spod out and filling it in, yet if I saw no fish then would always introduce feed on a little and often basis. This evening was one of those which saw very few fish showing apart from carp at distance, but this at least this told me that fish were active and were probably feeding, as in my mind moving fish are feeding fish! Unless fish are really active then I prefer to feed liberally and tonight felt that four spod loads of particles, mainly hemp and maggots would be enough for each rod. This amount was what I felt enough to get a few fish interested and feeding but not too much to place the odds of a fish picking my hookbait up as very slim. The way I tend to introduce feed is different to most as I like to actually use the rods I’m fishing with to tie on my spod (I hate Spombs) and cast out. This may take longer, than that when using a separate rod, but it gives me the confidence that when I remove the spod and replace with my feeder and hooklink that I’m bang on the money every time. Image 5 – All I feed when targeting roach are maggots and hemp which I deposit using a Gardner Pocket Rocket. A word of warning – only mix maggots with hemp immediately before spodding out as left over any amount of time and the maggots will take on the oil, become buoyant and float! The first thing that I do when I think of baiting up is to look out into the swim and choose a far bank marker that will stand out after dark that can be cast too (this lake is fairly uniformed with no noticeable underwater features so it’s a case of creating your own feeding zone). Next job is to fill the feeder to be used with groundbait, as this gives a true casting weight, and then cast out. If the cast is smooth and an acceptable distance is achieved then the mainline is placed within the reels line clip before a reference mark in the form of an elasticated stop-knot is tied just off the clip. The feeder is then retrieved, replaced with a small Gardner Pocket Rocket, filled with bait and recast making sure the line clip is hit each time. After four casts replace spod with feeder, tie on a hooklink and cast out. Repeat with second rod. Image 6 – Casting after dark comes with its own problems so make sure that you make a mental note of a far bank marker, such as a higher tree on the far bank that will stand out after darkness that can be cast too. Image 7 – Top Tip – If you find that the pole elastic hinders your cast then tie it next to the reels line clip and position it here every time before casting. Religiously do this and you will never suffer from a stutter cast again? Image 8 – Its all well and good casting to a far bank marker after dark but landing the feeder at the same distance every time also needs to be addressed. This is where a stop-knot made from pole elastic will help. If I were not to clip up and mark up then I wouldn’t feel that I was fishing properly. I know that getting into such a methodical casting routine isn’t easy, but if you keep doing it then, believe me, one day you will find yourself doing it as a matter of course. I need to know that when I bait up and cast out that I have done everything possible to stack the odds in my favour that if a hungry fish enters my swim then it will find my hookbait and become hooked. Confidence plays a massive part in catching consistently so pay attention to detail and do everything possible to get things right. Without going into too much detail, casting accurately is what I would say stops many anglers catching more fish. Most anglers that know they struggle with casting simply continue to struggle as they don’t practice. Just like a golfer heads to the driving range to improve, if more anglers headed to a their local lake or even a playing field, placed a dustbin lid at say sixty yards then, clipped up and stated casting to it would soon see a massive improvement. First cast settles the nerves. Having baited up and cast out it was time to sit back and wait, yet it didn’t take long for the alarm to sound and the spool to spin. All the way to the net I thought that the culprit was a big roach but it wasn’t to be as a lethargic common carp around three-pounds slid over the drawstring. Although I was after roach, I certainly wasn’t disappointed at this rude intruder as my aim at the start of a session is to get a fish, any fish feeding on my spot as once one starts, others, hopefully roach will follow as fish are curious creatures and will be sure to investigate any area of water that clouds up. Working by day and fishing by night mean that sleep is needed at some point, so it’s important that a schedule is draw up and that the rigs used are created to self-hook your quarry. I had decided that I would fish hard till 11pm, even if the fish weren’t feeding, and then hopefully get some sleep before setting the alarm for an hour or two before dawn and fishing hard again for a further three hours. This would give me, what I felt was the best chance of a fish or two. Fishing hard means casting every twenty minutes without fail as this not only keeps the swim topped up but I also find that bites often come soon after a recast. Image 9 – The Helicopter rig shown here next to a maggot feeder yet to empty. Notice the hookbait sitting close by which will surrounded by lots of freebies after just a few minutes. The helicopter rig needs little introduction and it was these that I choose to use as the short three inch hooklink makes it a self-hooking rig. A hooklink made from 5.14lb Reflo line, one with a Drennan Super-Specialist size 16 micro-barbed hook at one end tied knotless knot style and a tiny Nash Micro Swivel covered by a Nash Micro Hook Sleeve on the other is trapped on the mainline (6lb Gardner HydroFlo) between two float stops. To the end of the mainline I initially tied on a Drennan 25gram Gripmesh feeder, however this was to be replaced as the night went on. On one rod I decided to use a hair-rigged fake red maggot as this had been so productive for other species in the past and would at least produce a few fish during the night, or so I thought! The other rod was baited with three real red maggots. Image 10 – If your rig is working correctly then every fish will be hooked in the bottom lip. rk which I always mix up on the dry side before sieving a couple of times. You have to work fast as the maggots will soon break through the groundbait plugs, so on filling you need to squeeze both ends of the feeder right up until you cast. 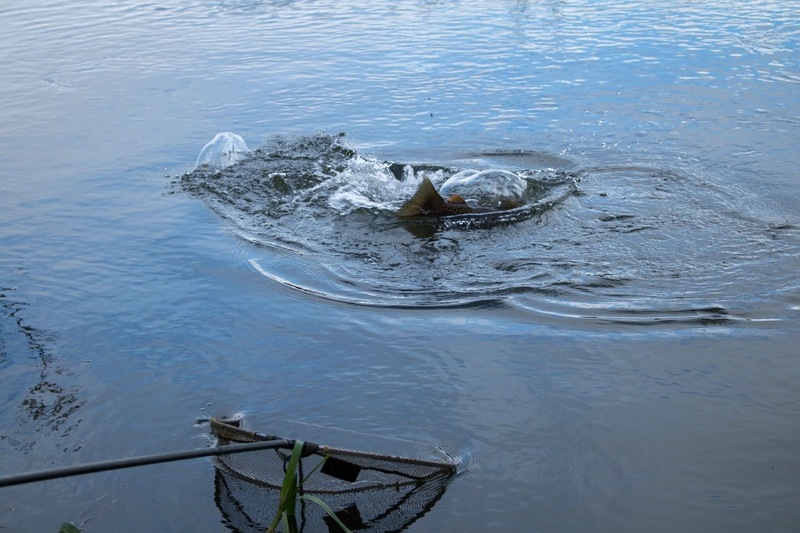 Once cast out its important not to move the feeder, just drop the rod tip in the water, take time to sink the line before placing the rods on alarms and attaching the bobbins. This is an area where so many anglers don’t concentrate and end up pulling the feeder away from the feed as they place the rod on the rests. Try and say to yourself, once you feel the feeder hit the bottom, don’t move the feeder. By understanding this you will get into your own routine of placing the rods on the alarms and tightening the mainline up to the feeder without moving it. Image 11 – Keep the maggots compressed within the feeder right up till the point of casting. Image 12 – The helicopter rig next showing the maggot sandwich and hookbait just before breaking down. Image 13 – The maggot sandwich emptied through the feeder. Simply irresistible to any roach. The rods that I use are the ever so versatile Nash 10ft 1.75lb Scopes and the reels Shimano 4000. I like to get my rod tips close to the lake bed if possible and to fish the line between rod tip and feeder tight as this helps in the hooking properties of the rig. Baitrunners are set to give line, not too easily but enough so that if a tench rips off with the rig it won’t break the hooklink. It’s difficult to get right initially but just like casting will come in time. Image 14 – 10ft 1.75lb Nash Scope rods, extremely versatile and ones that I use almost extensively now for all my specimen coarse fishing. Image 15 – Keep a tight line from rod tip to feeder, have the slightest angle of drop on your bobbin, set your freespool tight but not to tight and keep the rod tips as close to the bottom of the lake if possible as all these small things will help in the hooking properties of the rig. Well after the carp first cast the rod fished with the live maggots continuously produced fish. Most were rudd off around 12oz along with a super sized gudgeon, however one roach of around 1lb 4oz meant that I could indulge in a glass of red the following evening. The strange thing was that even though the rod with the fake maggot was recast every twenty-minutes not a single bleep came to it. Time to slow things down and get some kip. At 11pm I decided that I would swap the live maggot rod with a fake maggot as I needed some sleep. This worked a treat but as I lay half asleep on my bed chair I couldn’t help thinking that I was here to catch fish and that by using fake maggots was avoiding fish. Time for a rethink so at 1am it was off with the cage feeders and on with Drennan 22gram Feeder Bombs as I thought this would place more real maggots around my hookbait, create some competition and hopefully a fish or two would be landed, wrong! Image 16 – Keep your mind open and don’t be afraid to change from a groundbait feeder to a maggot feeder if you think it will catch you more fish. Although asleep my mind was working overtime. I knew I had fish in my swim, but the fake maggots weren’t getting any interest so at 3am I decided to change both hookbaits back to real maggots. Straight away the rods started to produce but instead of 12oz rudd came quality roach to over the pound and then at 3.50am I hooked what felt like a really decent fish. Playing roach on such small hooks isn’t fun, all you do is slowly draw them towards you making sure that the backwind is on and the clutch is slackened right off. After a few minutes a roach, I knew was close to my target, lay in the folds of the landing net and once on the scales pulled the dial round to 2lb 1oz. If that wasn’t enough more roach followed including fish of 1lb 12oz and 1lb 14oz and then at first light they simply disappeared as if they weren’t there. The bobbins still called for my attention but every time it came from a daytime feeder, tench. Image 17 – Dawn came and after a hectic night landing numerous quality roach they disappeared, however the tench then arrived. Image 18 – Top Tip – For years I tied my hooks on using a six turn blood knot, however the hook holds that a hook tied on knotless knot style are far superior. I have to admit that I returned home somewhat gobsmacked at the amount of roach that were present in a lake that I thought I knew inside out! Just by fishing at the wrong time of year, using the wrong bait and only doing daytime sessions meant that I had overlooked what could turn out to be something very special indeed. Duncan Charman is sponsored by Nash Tackle and Bait and has his own website www.duncancharman.co.uk He regularly contributes to top weekly, Anglers Mail magazine.He is also an angling guide and can be booked on a daily basis for most species including carp, pike, perch, zander, chub, barbel, bream, grass carp, crucians, roach, rudd, grayling, tench and golden orfe. For more information and prices email him at duncancharman@me.com or give him a call 07928 617006 / 01252 315271. Stick float fishing on the river Blackwater. Just returned from guiding a customer to some fantastic stick float fishing on HWAS stretch of the river Blackwater. Every swim produced bites, mainly from quality roach to 1lb 4oz along with chub to 3lb 8oz, perch, dace, gudgeon and a 7lb pike that grabbed a fish on the way in. All in all probably over 30lb of fish. 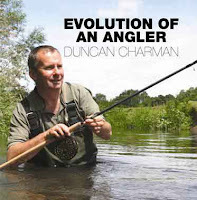 Need a couple of ideas for Christmas this year?If you like books then why not order mine 'Evolution of an Angler' from www.calmproductions.com? 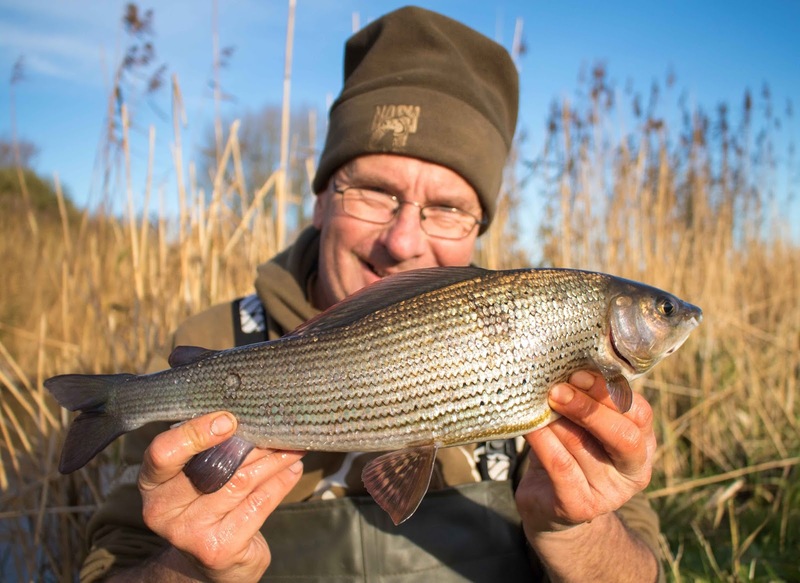 Grayling season off to a brilliant start. It was a date that I was really looking forward too, Nov 1st, as this see's many trout beats on our southern chalk streams opening there doors to grayling fishing. 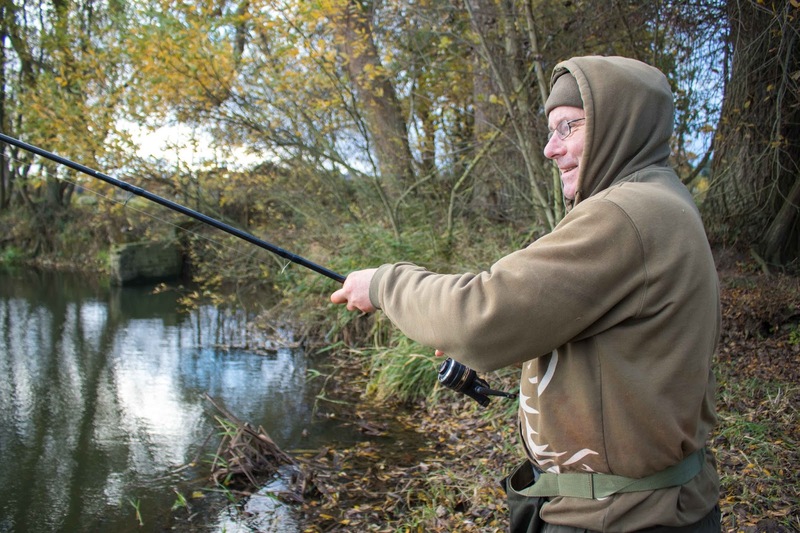 Having spent numerous years visiting expensive day ticket stretches of the Itchen and Test for an elusive two pounder it was time to venture back to the Frome. Although last year saw me treading its bank I had left it till the turn of the New Year to start grayling fishing and as we all remember it was a time when the rains came and sent most rivers into flood. A couple of trial sessions showed its potential as quite a few near two-pounders graced the net but unable to fish much of the river due to the river being in the surrounding fields meant it was time to start early this year. Arriving around 8am after a good trip down, myself and Chris weren't surprised to see a few others anglers already on the bank. With miles of river to go at this was not a problem and travelling light we managed to walk from boundary to boundary locating lots of potentially un-fished swims. Using corn as hookbait and trotting through using a centrepin I was the first to score. Straight away I knew this was a big grayling and initially thought it was a high two, if not a three as it looked massive in the water and even launched itself clear of the water twice! It was adrenaline pumping stuff and a quick photo recorded the capture and within minutes of arriving I was already contented for the day. Centrepin problems saw me soldier on, fishing far from as well as I would have liked but still more grayling fell and although we didn't catch from every swim when we did the average size was big. Another two graced my net later in the day plus a few high one's also fell along with the odd brown trout when we switched to maggot. The day was really to iron out any problems, like realising I have to buy a new centrepin, find a few new swims and really test maggot against corn. All in all one of the best days I've had this season and looking forward to plenty more to come. 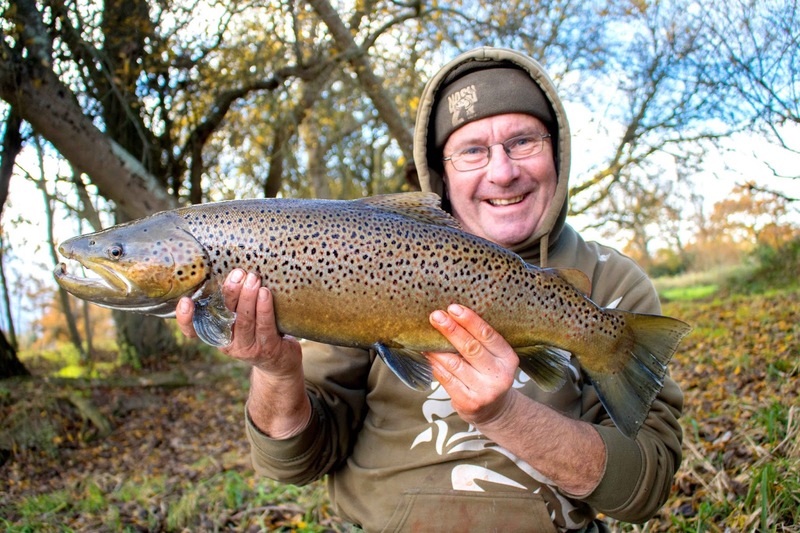 If you are interested in spending a day on the Frome with myself and enjoying catching such beautiful hard fighting fish then why not email me – duncancharman@me.com for prices and availability. Don’t worry if you haven’t got the right tackle as this can be provided along with bait and tickets and transportation to the venue.